The re-imagining of the groundbreaking Tony Award-and Pulitzer Prize-winning musical – Rent – The Original Soundtrack of the FOX Live Television Event is available digitally now, with the CD set for release March 1st – preorder it here. This past Sunday’s broadcast aired from the historic Fox Studios in Los Angeles. Acclaimed film, television and theater producer Marc Platt (“Mary Poppins Returns,” “Jesus Christ Superstar Live in Concert,” “Grease: Live,” “La La Land,” “Wicked”), along with the estate of writer/composer Jonathan Larson, executive-produced the television event. Tony Award-nominated director Michael Greif (“Dear Evan Hansen,” “Rent”), who directed the original New York Theatre Workshop and Broadway productions of “Rent,” was the director overseeing the stage direction; and Alex Rudzinski (“Jesus Christ Superstar Live in Concert,” “Grease: Live,” “Dancing with the Stars”) served as the live television director. The star-studded cast included singers, songwriters, and actors such as Kiersey Clemons, Brandon Victor Dixon, Jordan Fisher, Vanessa Hudgens, Brennin Hunt, Mario, Tinashe and Valentina. 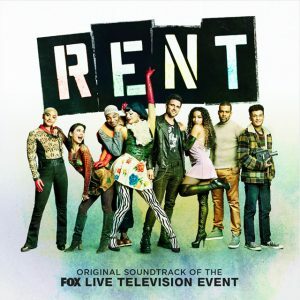 STREAM & DOWNLOAD RENT – THE ORIGINAL BROADWAY CAST RECORDING OF THE FOX LIVE TELEVISION EVENT HERE.